We will equip you with enough information to avoid frustration and giving up. First of all, unpack the wrap :), unfold it and tear off the paper label. Check if a manual has come in the parcel. Read it carefully as it provides step-by-step photo tutorial showing you how to tie the wrap properly along with the washing instructions. When to start learning to use the wrap? There is no universal moment for everyone. If there are no contraindications: the delivery ran smoothly leaving you and your baby in good health and the baby doesn’t require special treatment or rehabilitation, you can babywear right from birth! If the mother is to be the slingparent then it is vital that she feels strong enough and up to the task. In the early days after giving birth it's good to wear the baby when he demands it. If the baby doesn’t let you put him down it's of course better to wear him in the wrap than carry him in your arms. However, if the little one doesn't refuse to be laid down you can easily put aside the wrap for 6 weeks and allow your body to recuperate. Where to look for the best guide or educator? A step-by-step tying instruction will come with every wrap. There is also a variety of instructional videos available on the Internet. You may come across a tip to practise with a teddy bear to get to grips with long fabric and experience what it feels like to have a perfect snug wrap job done. All of these guidelines may work for you in the absence of a babywearing consultant in your neighbourhood or an option to travel to a larger town to take part in babywearing workshops. If you live in a bigger city which offers babywearing consultancy services or where local slingparents’ groups meet regularly, use their assistance! Babywearing consultant’s individual approach to you and your baby is always a better option than a paper or online instruction. Consultants not only teach: they also watch, listen, and accommodate the carry to your needs. Babywearing educators use special dolls weighted and shaped to mimic real babies to facilitate learning and teaching. Teddy bears are too light and too soft. Consultants will teach you to use as many carries as necessary devoting as much time as you need to achieve the desired effect. 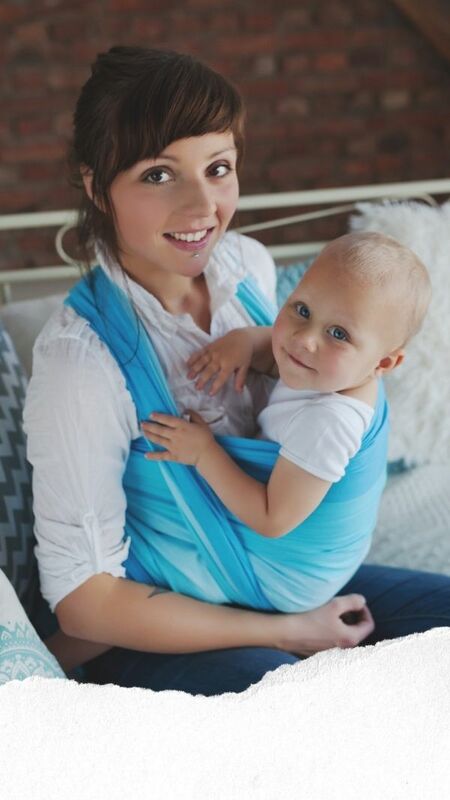 A common practice is to stay in touch with your babywearing instructor after the initial classes to have an opportunity to send them photos and ask them to verify if the baby has been properly wrapped. What to pay attention to when tying up the wrap? There are several basic carries perfect for the beginners. The most common are the kangaroo and pocket wrap. More advanced babywearing enthusiasts can try out a rucksack carry. 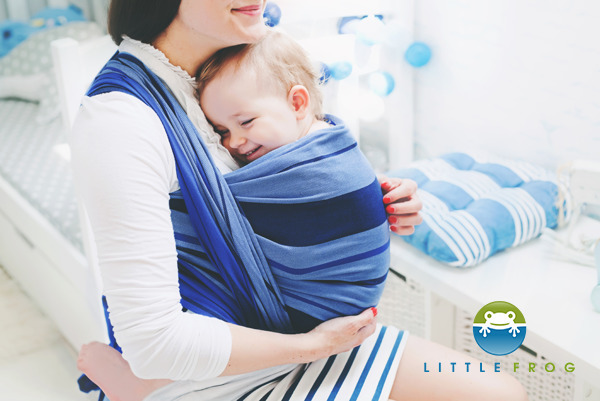 These carries allow the wearer to comfortably arrange the wrap and achieve the correct baby's body position, with the pelvis tilted forward and a rounded back forming a C-shape. The arms should be placed on both sides of the head, with elbows bent. The legs should be spread apart at 60-90°, where 60° spread is assumed by a newborn and can be gradually increased as the baby grows. The knees should be positioned above the level of the baby’s bum with the bottom edge of the fabric tightened firmly. The baby must be well supported and snug; otherwise the position might be harmful for baby’s kneepits, which is by all means to be avoided. When tucking the fabric between you and the baby the pelvis is tilted forward, which allows the baby to lean closer to your chest and supports the natural C-shaped curve of the spine. The top edge of the wrap should be at the level of the bottom earlobes. As the baby is growing and getting stronger, more active more curious and is able to sit on his own you can get his arms out of the wrap keeping the top edge at the shoulder level. Bear in mind that most baby carriers have a learning curve and they require practice to become comfortable with them. But it’s worth the effort. When you do it for the first time the baby may whimper, toss and turn and you are likely to get upset. Remember: babies can sense their parents’ uncertainty, so focus on your goal and above all: DO NOT LET YOURSELF BE DISCOURAGED! Keep practising! The more you practice the more skilled and confident you become.